I don’t know what to knit next. Now that the baby caps are finished, there are several things I need to be working on but I don’t know which to do first. I have a sweater I need to finish that I started in early summer but put down when I realized it wouldn’t be a “cool” summer sweater. 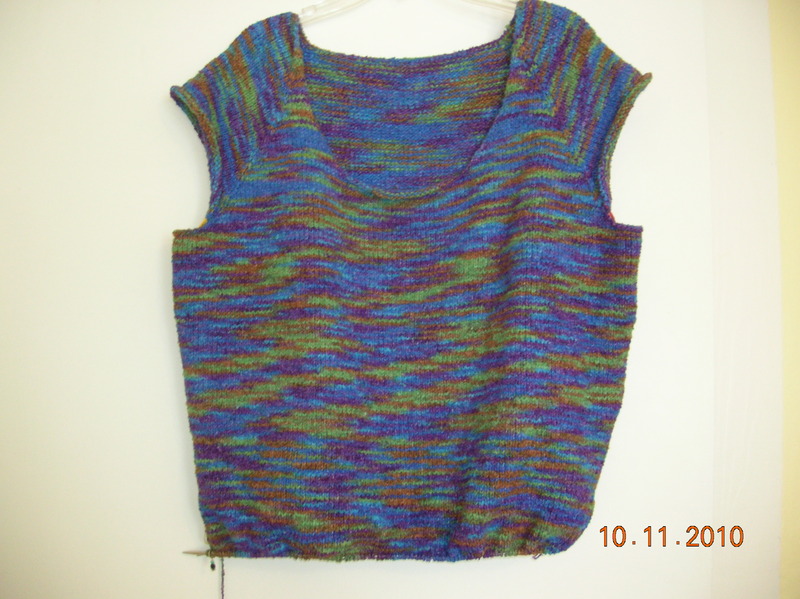 It’s a top down tee from Knitting Pure and Simple. A few years ago, I found the yarn on Discontinued Name Brand Yarns, and fell in love with it at first sight. It took me a while to get started but I wanted a pattern that was simple, with no detail as that would detract, besides it would be lost in the yarn. So I found it on the Internet but had a friend who owned a lys who ordered it for me. I started knitting it when I weighed 30 pounds heavier. 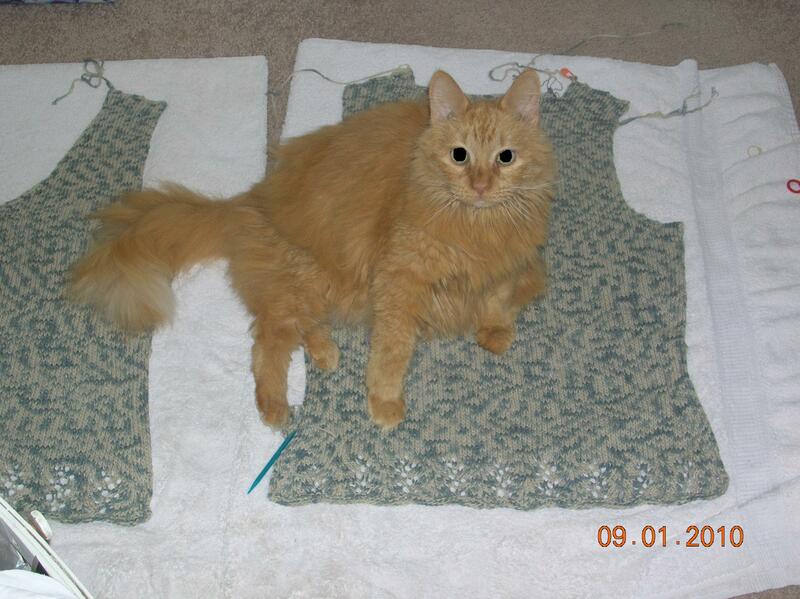 I hope it will still fit, but as a raglan sleeve, top-down sweater, it should. The linen/cotton sweater is still on the floor in my sewing/yarn room waiting for me to get the courage to seam it together. Actually, I have the courage; I just need to find a large block of time when I won’t be interrupted. I would hate to be half way up the side and have to stop. 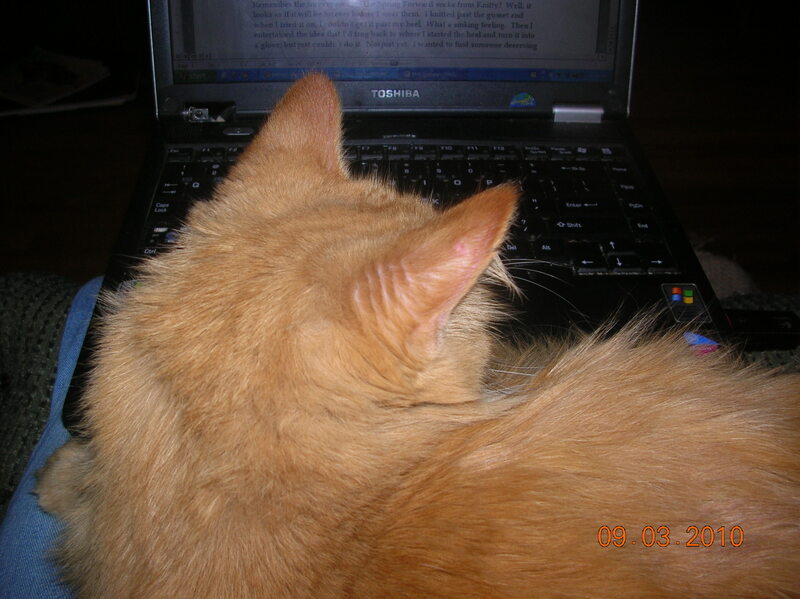 That’s Sweetie, who’s helping me type this. And purring. And the yellow lab, the very large yellow lab, is across from me on the sofa snoring and twitching her paws. I wonder what she’s dreaming about. Remember the forever socks? The Spring Forward socks from Knitty? Well, it looks as if it will be forever before I wear them. I knitted past the gusset and when I tried it on, I couldn’t get it past my heel. What a sinking feeling. Then I entertained the idea that I’d frog back to where I started the heel and turn it into a glove; but just couldn’t do it. Not just yet. I wanted to find someone deserving of a pair of hand knitted socks who has a small foot. I found her – my sister-in-law! She’ll be getting them for Christmas this year!